As a value investor, I am well aware of the power of dividends in one's portfolio. I too thinks it's very important to grow your side income as soon as possible. After all, it helps you build your nest egg faster. But I'm also very much aware of the fair price I need to pay for one stock. Like Warren Buffet once said : "It's far better to buy a wonderful company at a fair price than a fair company at a wonderful price." In my view, the wonderful companies are now trading at multiples that I find to be "off the chart" and not fair at all. Take for instance Canadian Pacific (CP), our second biggest railroad companies in Canada. The stock price is now 233 $. It's roughly 16 times the estimated cash flow! I love this company, but It wouldn't make sense to buy shares at this price. Besides, their dividend yield is not even close to 1 %. The other reason is also that I'm not chasing yield at all cost. I own a few small-cap growth companies like Alimentation Couche-Tard (ATD.B.). I can live with a meagre dividend, but I need to see potential growth in the company. In this particular case, the future is real. 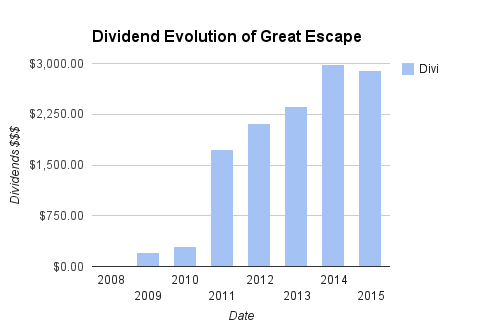 Having said that, my dividend income has grown in a steady fashion since 2008. You will notice my dividends have taken a little step back lately. The reason is simple : I sold some shares of my oil stock (essentially Suncor -SU) and a little bit of my REIT units in Cominar (CUF.UN). Nothing crazy, just a small tune-up considering the oil crisis. These guys are very nice dividend players. But I was kind of wary of the situation. I figured I would just reduce my exposition to the energy sector. Hence the little gap between 2014 and the beginning of this year. What do you think of my dividend evolution? How about yours? How much do you need it to grow in 2015?